I have had several people ask me for suggestions of chapter books for early- to mid-elementary children, and I now have a new suggestion that I am excited to share! The Bedtime Story-Books written by Thornton W. Burgess and illustrated by Harrison Cady are old-fashioned tales with titles such as The Adventures of Reddy Fox, The Adventures of Grandfather Frog , and The Adventures of Bob White. Because we are studying birds we started with the story about Bob White and his family. I love that these books are not only fun, adventuresome stories, free from any off-color language or crude themes, but they also teach simple concepts about the animals, as well as good life lessons in a format reminiscent of Aesop’s fables. Pros: These are pure and exciting readers that teach valuable lessons. Cons: While the language is very understandable, some words are not commonly used today and may be unfamiliar to young readers. In The Adventures of Bob White one of the young birds is shot. A brief discussion follows about the “dangers of guns.” While I did not see any problems with the way this was presented, considering that the book is from the perspective of a bird. Parents might take this opportunity to discuss the appropriate use of guns. A Child’s Good Night Book by Margaret Wise Brown is a very simple book. In this 1944 Caldecott Honor book the sentence, “Everything is going to sleep” pretty much sums up the entire story. Mostly animals are shown sleeping, but one page in the middle of the book illustrates boats, cars, and trucks being quiet at night. As a bedtime story I found this book disappointing and have found several better books for this purpose. 1. “Excellence of execution in the artistic technique employed.” I do not consider these chalk drawings with a charcoal overlay to be excellent artwork. Many of the animals are barely recognizable and all of the characters lack any expression. 2. “Excellence of pictorial interpretation of story, theme, or concept.” – The story is described well through the pictures, if one can make out what is pictured. 3. “Appropriateness of style of illustration to the story, theme or concept.” – The charcoal overlay does make an effort to help each illustration appear to take place at nighttime, but makes each picture even less recognizable. 4. “Delineation of plot, theme, characters, setting, mood or information through the pictures.” – The theme of sleeping is very clear, but otherwise these characteristics are vague. 5. “Excellence of presentation in recognition of a child audience.” – My 5-year old could recognize the characters in each illustration, but my 4-year old with vision impairment gave up and lost interest quickly. 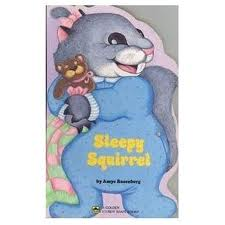 Sleepy Squirrel by Amye Rosenberg has been a long-time favorite of my 2nd daughter, Abigail. I think the reason she loves it so much is because she relates easily with the little squirrel who just cannot believe that she is sleepy. Throughout her bedtime routine of eating a snack, brushing her teeth, taking a bath, and putting on her pajamas she insists sweetly at every turn that she is not sleepy. Of course, by the end of the book she is quietly snoring before her bedtime story is even done. While doing research for this book, I found it for sale on Amazon for over $1,000 –used! Even though our copy is not in great shape, I will be keeping it safe from now on so I can read it in the future over and over. Pros: This board book is easy for little hands to hold, sturdy enough for toddlers to handle the pages, and a short, but precious read for any child. Cons: Due to the price, this is probably not a book you would want to buy, but one that could be borrowed from the library and kept in a safe place. Llama llama red pajama, one of the books we read today, is a delightful book for children and parents. The colorul, large illustrations make it easy and eye-catching for children of all ages. My infant, who I was holding as I read, was even studying the pages. The rhyming verses are attention-getting as they teach the concept of rhyming words. The story is oh-so-cute as Baby Llama is in bed and starts to think of all the reasons he needs his Llama mamma. My children could easily associate with Baby Llama’s bedtime predicament and I felt as though Mama Llama and I must have something in common as she dealt with the situation. Teaching points include rhyming, a few new vocabulary words, patience, and unconditional love. Llama llama red pajama is a great read-aloud for young children.